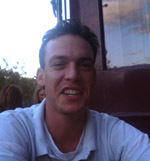 George joined Idlers CC from local club South Wilts at the start of 2006. Having previously played each week for South Wilts II's some 7 leagues higher than Idlers, George found the transition easier than some. In a League winning campaign George rewrote both the Idlers and Hampshire League record books becoming the League 2NW top run scorer smashing 3 centuries on the way to 600 runs. George carries a heavy bat and hit thirty 6's in 2006 including 11 in just one match. A fine 'start' to his Idlers career. Behind the stumps George is tidy and concentrated and rarely found wanting. Favourite Phrase : "Get stuck in here Idlers"
Click here for a run down of all George Shepherd's stats by season.